This October, the Stellarium Gornergrat launched two special weeks called “Space Trip” for hotel guests on site. Being a new format, we awaited the premiere with great expectations and were not disappointed. During the Space Trip weeks, hotel guests were offered one or two activities every day, introducing them to the night sky, actual space research, and astronomy. The excited participants were brought closer to the stars, literally. The first activity started around 5pm in any weather: The guests were taken up to the dome where they received a guided tour of the facility and the instruments and got an overview of the project’s goals and visions. The interest was even larger than imagined: Up to 40 people per night were eager to squeeze around the instruments and learn about space. Opening and closing the dome did not only excite our young guests but regularly brought a smile to the focused and composed faces of the numerous Asian visitors. After this introduction, the people moved down to the control room where they marvelled at different images that have been taken with the Stellarium’s different instruments and to immerse even deeper into Space. 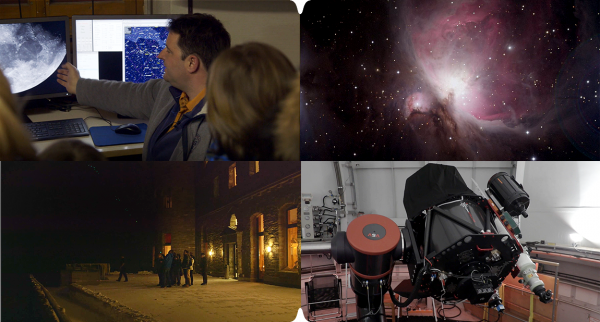 Shouts of amazement were not uncommon and the guests seemed genuinely impressed that the shown planets, galaxies, nebulae, and the open and circular clusters were all taken with the instruments they just visited. This part was purposely kept interactive and many questions were asked in English, German, and French. Often the discussion was going on downstairs during dinner across several tables. Sometimes guests were so excited that they would stand up and walk to the window every few minutes to check the weather and with it the chances for part 2 to happen. If the weather stayed good or improved enough from previously cloudy skies, all interested people would gather outside in the high alpine environment around 22p. Packed in warm clothes, we “walked” across the beautiful night sky: With a special Skypointer, a strong laser that creates a visible line up to the stars, the different constellations were introduced along with visible planets and even some deep sky objects as the Andromeda galaxy. The visitors learned how to distinguish planets and stars in the sky and how the stars seem to move around. Once, a few alpine ibex visited us, quite a rare sight at this time of the night. Fittingly, Capricornus was in the Southern sky watching over them. After being introduced to the night sky, we went up to the now open dome and used the Takahashi “LookThrough” telescope to observe some interesting objects. Dependent on the phase of the moon, they could look at planets, moon, galaxies, nebulae, as well as open clusters and circular clusters. Using a telescope with an eyepiece is a lot of fun and was the way the astronomers made their discoveries in the past. Often, the visitors stayed well after midnight, defying cold temperatures and sometimes strong winds. The feedback was overwhelming and always positive. Often, hotel guests came to the table at breakfast to shake hands and say thanks. Our experience with this Space Trip shows clearly, that the public is very interested in these topics and that our efforts to reach even more people are well spent. To these ends, we are working hard on finishing a dedicated web portal, a key piece required to reach the schools in Switzerland. With it, students and their teachers will be able to work through carefully designed pedagogical activities, which include scheduling observations online. The Stellarium Gornergrat executes the observations robotically and the obtained data can be downloaded online in the user’s data area. We are looking forward to many active users in the future.